Chresta martii (Asteraceae) is a plant found in the Xingó region (semi-arid area) in Northeastearn Brazil, and is recognized by the local population as a traditional herb used to treat gastric diseases. 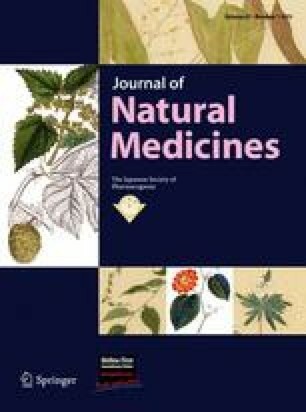 This is the first report of the chemical composition, acute toxicity, and gastroprotective effect in mice of the hydroalcoholic extract (HAE) from the aerial parts (leaves and flowers) of Chresta martii. Animals received HAE doses from 10 to 2000 mg/kg, i.p. or 50 to 3000 mg/kg, p.o.) and were observed over 48 h for toxicity signs and mortality; sub-chronic toxicity was evaluated through 14 days treatment with once-daily HAE doses (400 mg/kg, p.o.). The gastroprotective effect of HAE was demonstrated on the indomethacin-induced gastric ulcer model after the administration of extracts. Data comparison of ulcer index averages between saline and HAE (100 or 400 mg/kg, p.o.) groups showed significant (P < 0.01) inhibition (71.73 and 76.72 %, respectively) of indomethacin-induced gastric lesions. Histological analyses showed significant (P < 0.05) inhibition of leukocyte migration in HAE-treated groups. A fingerprint of the HAE obtained by HPLC/UV/MS analysis showed major peaks characteristic of sesquiterpene lactones. Compound 1 was isolated and elucidated as a new natural product. Its capacity to prevent leukocyte chemotaxis was demonstrated in vitro, corroborating the pharmacological effects observed for C. martii HAE. This work was supported by Conselho Nacional de Desenvolvimento Científico e tecnológico (CNPq), Fundação Cearense de Apoio ao Desenvolvimento Científico e Tecnológico (FUNCAP), Programa Rede Nordeste de Biotecnologia (RENORBIO) and the Swiss National Science Foundation (Grant no. 200010-100083 to K. Hostettmann).